Dubai, UAE, December 18, 2018: With the party season just around the corner it’s time to start planning outfits for all celebrations during the most wonderful time of the year. Embrace a contemporary and stylish look with stunning must have pieces from Marks & Spencer, including show stopping dresses through to chic tailoring. 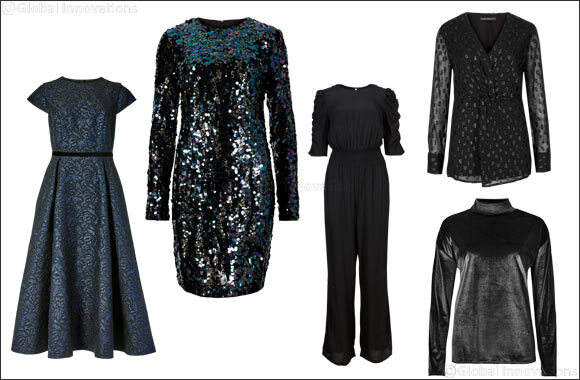 Sequins simply are the perfect way to make a statement during the party season. Choose from a mini or midi style for a sculpted and slimline flattering silhouette and let the metallic sequins offer some pops of sparkle for a stand-out festive look. Marks & Spencer’s mermaid sequin dress and skirt is the perfect choice to add some subtle colour pops of green and purple shimmer to any outfit. Take festive dressing up a notch with a velvet jumpsuit, featuring an elegant tie across the waist and stunning scooped back detailing. Team with flats for an effortless day look or with heels for all-out glamour. Velvet truly comes into play this winter across dresses, skirts and trousers, through to blazers, with easy-to-wear pieces for day through to night. For contemporary party dressing, try suiting up with a matching jacket and trouser. This modern interpretation will leave you looking sophisticated and sleek and will easily take you from desk to dinner. The Marks & Spencer offering includes statement trouser styles that will flatter everyone, from tailored slim leg cuts through to flowing wide leg styles, across on-trend velvet. A flattering skirt is the perfect choice for any festive feminine outfit, whether it’s a faux leather midi style with pleats or kilt style mini with buckle detailing. This stylish on-trend look offers a fresh take on the traditional party outfit and can be worn with key accessories for the season. Simply get dressed, head out and prepare to wow!